The sweeping tide of populist election victories has not been limited to just the US and Europe. There have been torrents in Asia, too. Though there is some disagreement whether he counts among them or not, India’s Narendra Modi swept to a historic electoral triumph in May 2014 sure sounding a lot like one, maybe even one of the first. Like European and American populists, this wasn’t supposed to happen. Modi’s campaign prior to the election was widely mocked (by all the “right” people, too). He appealed largely to a growing sense of unease, one that wasn’t shared by people doing well nor much acknowledged in official communications. For much of the Great “Moderation” India’s currency was pretty stable. 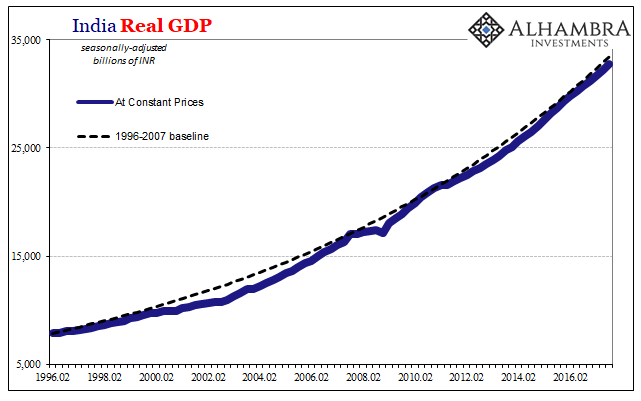 During the 2000’s up until the Great Financial (Dollar) Crisis, there was practically no volatility in it at all. 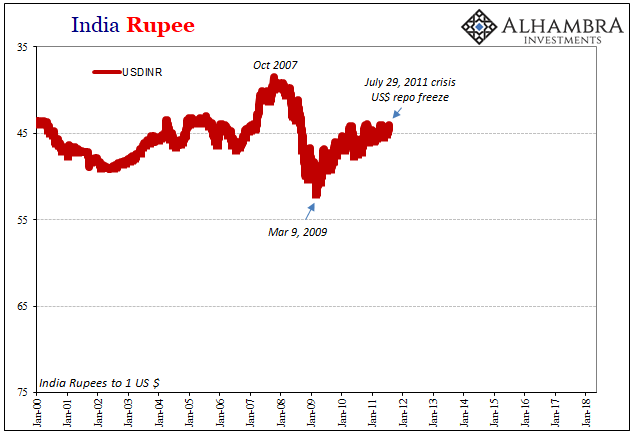 During the panic, the rupee fell like so many others – ending the “devaluation” exactly on March 9, 2009. Recovering quickly, it wasn’t until the 2011 crisis (again, an exact match for it) the rupee and India’s inflation problems really began. 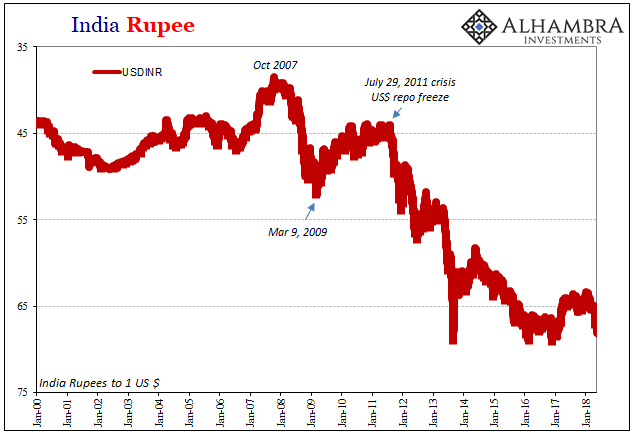 In that way, INR has been a pretty good indicator for global “dollar” conditions and especially this post-2011 sort of permanence to it all. This has been so even though India’s economy by and large hasn’t been all that greatly disturbed by the eurodollar’s ongoing negative influence. It was a huge shift or flex in global dollar positioning, little wonder that EM currencies sold off so dramatically in response. But it is wrong to suggest, as many observers do, that this “rising dollar” is a “flight to safety” since it is nothing of the sort. In reality, it is an unwinding of dollar leveraged positions, including carry trades – but not exclusive to them. As we have seen in US bond markets, an expensive dollar has local ramifications as well. 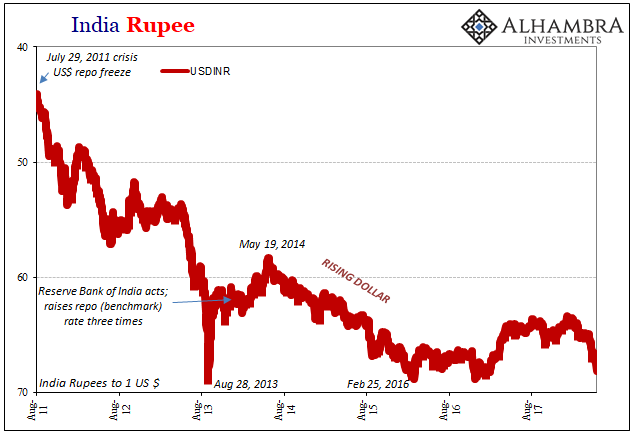 Over the next several months, until May 2014, it would be much calmer for INR. The EM storm or “rising dollar” would move on to other places mostly China and the other two BRIC’s. Many credited and still do the Reserve Bank of India’s late 2013 policy actions for that relative tranquility, I think it more likely India being by far the cleanest dirty shirt out of that particular bunch. Whatever the cause, INR would fall again during the main of the “rising dollar” episode, finally hitting bottom in later February 2016. It would be tempting to attribute the currency’s slide to that particular election, it began only days afterward, but we know better the far larger monetary forces at work. That is what we are interested in today. India in 2018 doesn’t appear to be in danger of any major retreat. 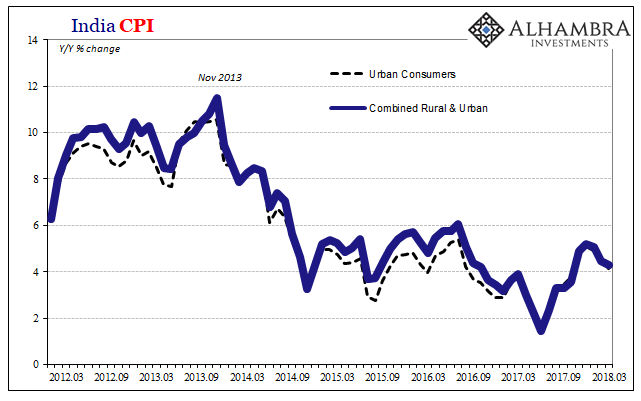 Economic growth has stalled somewhat (on the charts above you can see the trend in Real GDP has shallowed a bit of late), and inflation has ticked up albeit off very low lows. 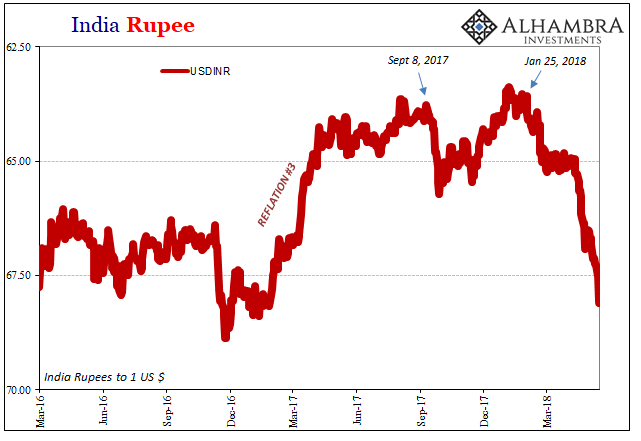 Instead, INR appears to signal once more unwelcome “rising dollar” tendencies despite whatever very real advantages the Indian economy demonstrates over its rivals. It is the timing and more so the intensity of this latest move that draws our focus. Reflation via appreciating INR proceeded pretty solidly until first clearly interrupted (when else?) that special week in early September 2017.  A temporary setback, the big move began around January 26, 2018, in the days leading up to the global liquidations. INR has since that time just about crashed; it hasn’t behaved like this since 2013. It’s an unsettling prospect in that it might propose a major shift in global eurodollar liquidity and balance sheet capacities. It’s one thing for Argentina’s peso to undertake a radical pounding despite its former darling status; it’s quite another for an Indian currency that should reflect some greater measure of stability by its own fundamental prospects. Yet, as of today dropping below 68.00, it is trading closer and closer to a new low and heading that way in truly rapid fashion. It never did get as far as 69.00 even though it came close on three separate occasions. In addition to Brazil’s real, this can’t be idiosyncratic factors. There are too many major moves all lining up together and in the wrong direction. It started with repo, and that part is confirmed. 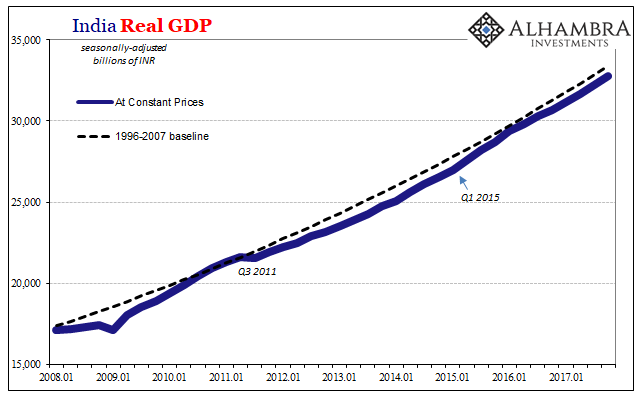 The real question is what this all means, up to and including whether it marks like fails in June 2014 the start of whatever the next phase of eurodollar decay might be. We obviously won’t know anything like that for some time (and we have to be very careful about bias, meaning that since I suspect it, it’s easy to believe and see what I think is already there), but the biggest clue will be in escalating warnings like this.